Valentine’s Day has come and gone. Many a couple enjoyed a romantic dinner downtown on the holiday of love. Wonder what options you might have had in years past? 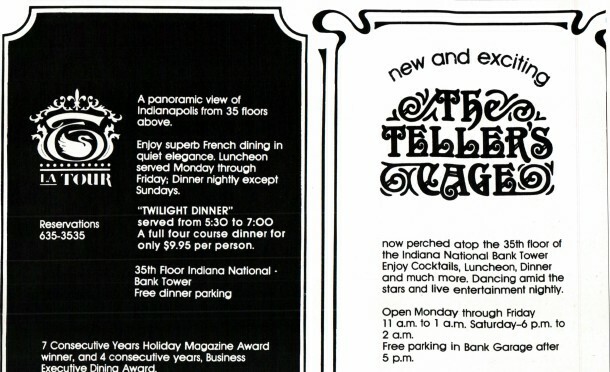 In the Seventies, you had several options for skyscraper dining, including The Eagles Nest atop the Hyatt Regency and the Carousel overlooking Monument Circle in the Hilton. Probably the most notable locale for budding lovers was La Tour, perched high above the Indiana National Bank Building. The French restaurant was a go-to destination for nearly two decades. The opening of the Indiana National Bank Building in 1970 symbolized that Indianapolis was a city on the grow! The marble and glass tower rose 37 stories above street life, taller than any building in the state. On the 35th floor stood the flagship La Tour restaurant. Building management promised French cuisine served until 1:30 a.m., in a dining room capable of seating over 140 people, all with a spectacular view. The restaurant proved a hit, serving numerous gourmet luncheons and hosting social events. Although unbeknownst to diners at the time, one of the first celebrity chefs took over the kitchen in 1973. Austrian Wolfgang Puck was one of three young chefs brought in from abroad. Puck elected to come to Indianapolis with the belief that it would be similar to Monaco, due to the racing heritage the cities shared. Upon arrival, he was scoffed at and told people in Indiana only eat hamburgers and hotdogs! Wolfgang did tough things out for a year and established himself as the restaurant’s best line cook. He was quickly off to bigger and better things, however, leaving Indy for Los Angeles to create the gourmet pizza craze. 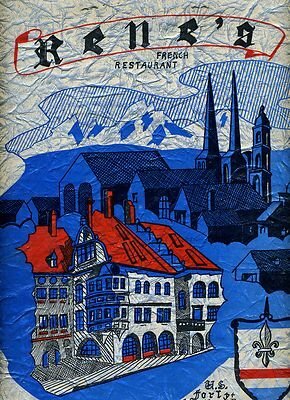 By 1987, the restaurant was in for a change. Marriott Corporation took over the food service operations for Indiana National Bank. A full-scale renovation of the restaurant began, and French chef Allain Biller was brought in from Chicago to oversee the kitchen. This refresh proved unsuccessful, as tastes were already changing. 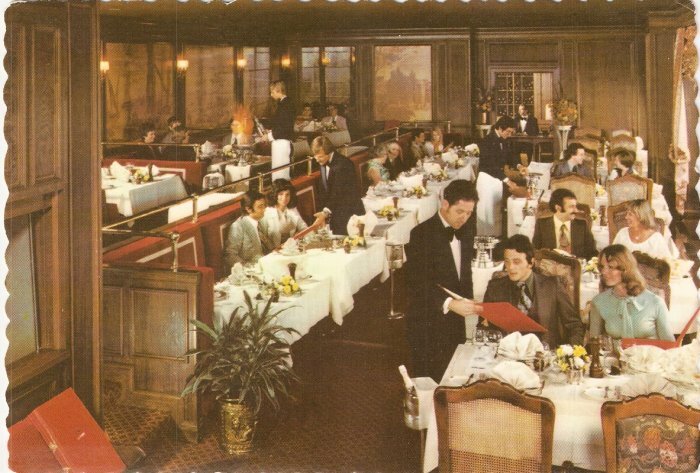 Diners no longer sought out the formal atmosphere restaurants that La Tour or the venerable King Cole offered. 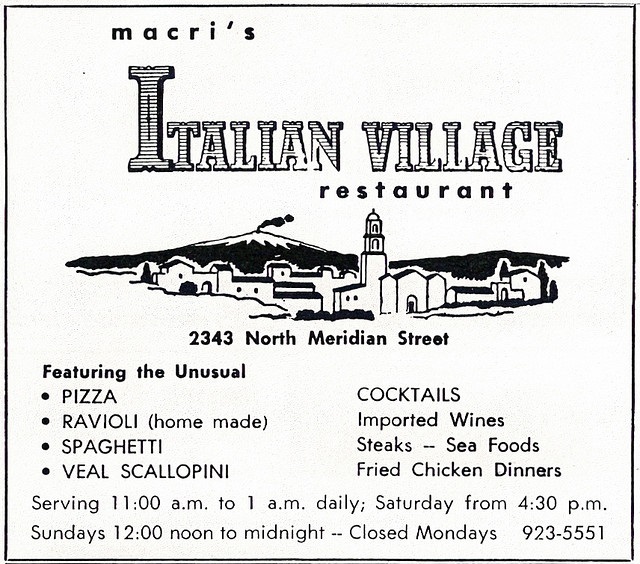 The restaurant closed in 1989 and was replaced with the more casual Pennsylvania Street Bar and Grill. 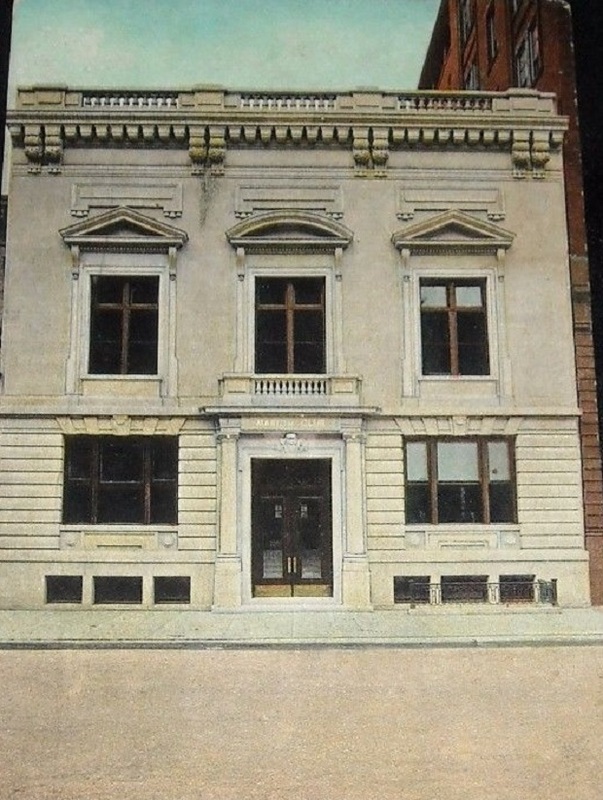 In 1992, Indiana National Bank was acquired by the National Bank of Detroit. The building suffered high vacancy rates as the local work force dwindled. Today Taft Law occupies the former space of La Tour, and there is no evidence that a restaurant ever existed on the 35th floor. At Your Leisure: The Marion Political Party! I ate at the Teller’s Cage which was in the LA Tour space in the late 1990’s when I was working at the Indiana State Museum. The view was fantastic. The food was more of a regular lunch fare. It was in a big red book with a swan on the cover and LA TOUR under the swan.